The other day I called my computer helpline, because I needed to be made to feel ignorant by someone much younger than me, and the boyish-sounding person who answered told me he required the serial number on my computer before he could deal with me. Almost every business today has to face a great challenge of delivering customer service and support to people hailing from multiple generations. The fact is that in terms of customer service, expectations of one generation can significantly differ from those of another. To be able to deliver exceptional customer service across generations, support representatives need to be aware of differences in defining good customer service and special aspects of communication with customers from various age groups. And without a doubt, they must be able to respond to the expectations of each group accordingly. For the first time in history, customer service reps are communicating with customers spanning four generations, from Matures and Baby Boomers to Generation X and Millennials. Have you ever asked yourself what are the reasons for the generational differences? What does good customer experience mean to different generations? 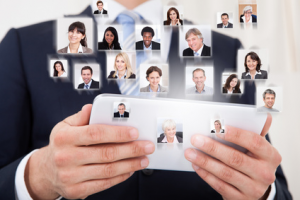 How can your customer service reps meet the expectations of each group? Let us take a closer look at lifestyles, service expectations, attitudes and technology use of each generation and come up with some customer service tips then. 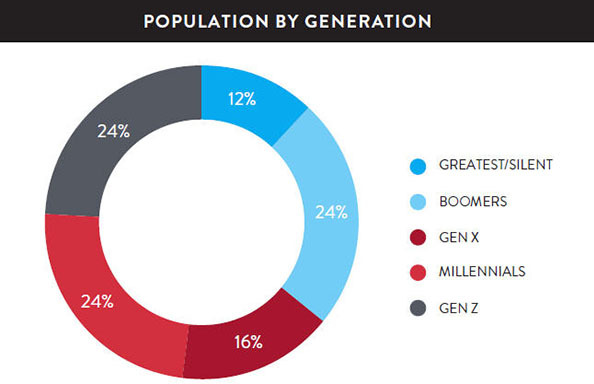 The chart below shows 2014 U.S. population’s distribution by generation based on research from Nielsen. This is the oldest generation living today, and the majority of them is well into their retirement years. It would be a mistake to say that this group tend to be technologically illiterate. Rather, many of them are highly fluent in online and computer skills. However, this group can be described as late adopters to technology and many of them might feel overwhelmed and confused by complicated procedures and instructions. As a rule, Matures expect more personal attention, and therefore a perfect way of providing support to this group would be to focus on treating them as individuals, making them feel special, being patient and delivering “high touch over high tech”. Screen sharing and remote assistance tools used along with phone support channel would be a great help for those clients who find themselves technologically challenged letting customer service reps drive the support and problem resolution process. This group, born between 1946 and 1964, represents a very large customer demographic. In many cases they can be described as early technology adopters, optimistic, straightforward, and pretty less formal then the Matures. Though their technological skills often vary widely, they are generally much better than those of the Matures. Boomers are highly networked customers, and they would like to take an opportunity to interact with other customers through social media like Twitter and Facebook, sharing their experiences and spreading the word about your business. In terms of service, Boomers are independent, with a “can-do” attitude. They like to dig in and overcome obstacles on their own. Their work-life values in many cases transform into expecting from your support 24/7 availability and first-call resolution performance. If a Boomer customer has a problem, value their time, be solution-oriented, and be ready to give them all the information they need to make an informed decision. Members of this generation are largely computer literate, they value choice and independence. Being skeptical and self-reliant know-it-alls, they tend to do their own research online before ordering your products and services. Gen Xers value streamlined processes and systems, and prefer informal, casual, high-tech communication. If you want to keep them as lifetime customers consider providing service through a wide range of support channels and allow them plenty of time to ask questions and gather information they need. They expect the service to be fast and efficient, and would rather receive information and choices in real time than wait for a service rep to call them back. Today’s new adults. This group grew up with personal computing, the Internet is their medium for learning, entertaining and communicating. They expect your support reps to be as technically savvy as they are, keeping things cheerful, fast and fun. They can be impatient and need information quickly, and often want the ability to pick and choose what they want. They expect you to serve them where they are, when they want, customizing your approach to what is relevant to them. To win them over as a lifetime customers, recognize that this generation is more mobile, internet savvy and selective than any in history. Encourage them to follow you on Facebook and Twitter, be sure to provide real-time support and focus on their needs. Do your support representatives interact with several generations of customers? Have you noticed how the expectations of one generation differ from another? Have your customer service reps ever been dismayed when they failed to meet expectations of the customers from different age groups? Tell us your story through the comments section, we would love to hear from you. And as always, thank you for reading our blog! This entry was posted in Articles and tagged boomers, four generations of customers, GenX, millenials. Bookmark the permalink. I am a wife and mother of 3, but never really thought of myself as old. I looked at my parents as being out dated so to speak. lol It wasn’t until I started college that I saw how out dated I was, I knew nothing about computers, and all these young just out of high school students helping me, they are all so great. But yeah, I have seen where customer service was there to help me and would be trying to explain something to me and I was completely lost, all they would do is keep telling me all this technical stuff to do and that did nothing for me. You could tell that they were frustrated, you know in their mind they felt like saying ” look old lady put your grandchild on the phone lol”, but I would put them out of their misery and just give up because I was the one that would run out of patience way before them. Now and days these kids whip through everything like its nothing but I still give them their props and hope they still keep helping me out in class.